In this article, we'll use the Google App Script platform to get data from Stripe into Google Sheets before creating a new Spreadsheets widget. Make sure you're already logged into your Google Drive account. Make a copy of this Google Sheet. To find your Stripe secret key, log in to your Stripe account. Click Account from the top right hand of the page. Click the API Keys from the top tabs. Here, you will need the Live Secret Key. Return to your copied Stripe Sync 1.8 spreadsheet. From the navigation menu, click Add-ons > Stripe Sync > Setup. In the pop-up window that appears, enter your Live Secret Key, Granularity, Initial load and Metrics where prompted. Select a cell in your spreadsheet where you want balance data to be written. Click Add-ons > Stripe Sync > Initial Load. When you want to manually refresh the balances, click Add-ons > Stripe Sync > Manual Sync. 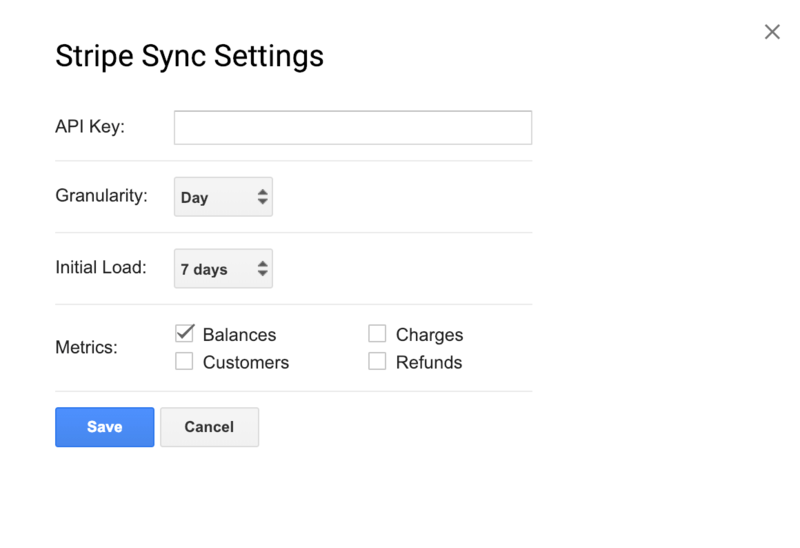 To schedule the values to sync every hour, click Add-ons > Stripe Sync > Schedule Sync. To cancel this schedule click Add-ons > Stripe Sync > Cancel Schedule. With your data now populating your Google Sheet, switch to your Geckoboard dashboard to start creating some Stripe widgets. Alternatively, you can also scroll down the alphabetical list of integrations until you reach the Spreadsheets integration. Click on the Spreadsheets integration. Choose the copied Stripe Sync 1.8 spreadsheet with your Stripe data on. Create your widget by configuring the way you’d like to visualize the data. And that's it! You may also find this step-by-step video useful.